Be the first to share your favorite memory, photo or story of Fred "Duane". This memorial page is dedicated for family, friends and future generations to celebrate the life of their loved one. Fred "Duane" Smith Collins, passed from this earth on March 24, 2019, in Mercy Hospital, Springfield, Missouri. He was 82 years, one month, and 27 days of age. Duane was born January 28, 1937, to John Fred Smith and Grace Collins Smith at Vanzant, Missouri, in eastern Douglas County. When Duane was 6 years old, his mother passed away. In the aftermath, Duane and his younger sister and brother lived for a while with their father. Later, all three children were adopted by their maternal grandparents, Robert and Anna Collins. Duane attended grade school at Willow Springs #2, in Vanzant, Missouri, and attended high school at Dora, Missouri. As a young man, he traveled out west to work the harvest seasons in Washington, California and Idaho. Duane also worked as a machinist in Dallas, Texas, making aircraft parts for the military. On June 4th of 1958, he married Ruth LaVonne Fish in Vanzant, Missouri. Duane and Ruth moved to Rochelle, Illinois, where he worked as a foreman in the canning department for Del Monte. In 1965, he came home to Missouri with his family and worked for Mid-Am Creamery, now DFA. Duane settled his family on a farm in Vanzant where he raised beef cattle and worked in the timber as a logger until he retired. Duane and Ruth were married for over sixty years. They were blessed with a daughter, Darrah Collins, a son, Kelly Collins, one grandson, Dustin Michael Pettit, and three granddaughters, Grace Jayna, Leah Hope and Bella Faith Collins. Duane was saved and baptized and was a long time member of Willow Springs #2 Church where he served as Superintendent and Deacon. Duane was a woodsman who loved to be outdoors. 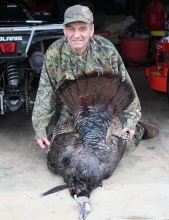 He enjoyed hunting and fishing, but there was always a special place in his life for turkey hunting. He also enjoyed square dancing and going to country and bluegrass jams. Best of all, were the times spent with his family and friends, talking and laughing with a laugh that will always be remembered. He is survived by his wife Ruth, his children and grandchildren, his sister, Wilma Hutchison, one brother, Doyle Collins, nieces, nephews, cousins, and many friends. To send flowers or a remembrance gift to the family of Fred "Duane" Collins, please visit our Tribute Store. "Email Address" would like to share the life celebration of Fred "Duane" Collins. Click on the "link" to go to share a favorite memory or leave a condolence message for the family.